This year in 3rd (4th? 5th?) grade we will be doing a plethora of awesome projects that will go along with a book or topic that we are covering in class. This project is meant to tap into the creative side of learning and will hopefully be fun for your most wonderful child. We are looking forward to seeing what your child can come up with. We are NOT looking forward to seeing what YOU can come up with. This is your child’s project, not yours. Holster that glue gun, ma’am, and step away. Further. A little further…THERE. Right there. Close enough to help, if needed, but far enough away to keep from trying to hip-check your kid out of the way so you can just take over and do the whole thing yourself. We know, we know…ALL the parents are doing it, man. But really now, if all the other parents jumped off a bridge would you jump too? Hmmm? No, we don’t believe you would. 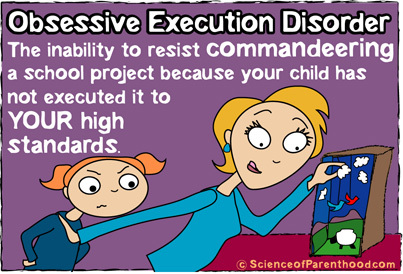 Let’s apply that good old common sense to your child’s school project. It is a project for an 8-year-old to complete. We know 8-year-old work. We know what to look for. We know that if we assign the “take a real pumpkin and make it look like a character from your book” project, and that squash comes back all carved up, glued up, and modge podged up until it looks more like Harry Potter than Harry Potter himself…well, we know that that is the work of a Pinterest-loving mama. If the pueblo in your 5th grader’s Native American project looks so cozy and inviting and well-crafted that we find ourselves regularly fantasizing about actually taking up residence in it and living off the land… we know it is not something that your child created. We know you mean well. And some of you may actually get excited and want to do these projects for your kids because they are fun. But some of you may feel like you HAVE to do these projects for your kids because that is what every other parent is doing. Well, we are letting you off the hook this year. If you’re child’s project comes to school with the professional touch of a creative parent, they will be asked to do the project over…and you will be tarred and feathered and set on display next to all the appropriately created 3rd grade projects during open house. As a teacher, I finally changed all the at home projects to FAMILY projects because that what was happening anyways!